Unlike many 19th century novels, students are likely to already have some idea of the central premise of The Strange Case of Dr. Jekyll and Mr. Hyde before they read the novel – the concept of duality and the sinful double life. However, they are less likely to be aware of Stevenson’s portrayal of hypocrisy and its secretive, corrupting influence in Victorian society. Why might you pretend to be someone else? What do characters use their alter-egos for? Why might you keep an alter-ego secret? Highlighting the social hypocrisy of Jekyll’s duality is essential to students’ understanding of the novel. What was shocking for Victorian readers was the notion that members of the professional classes could be criminals. With their rigid sense of social respectability and a class system that encouraged a hierarchical view of moral superiority, the Victorians expected criminals to belong to the lower classes, to be poor and uneducated. Stevenson’s novel went a long way to shifting this viewpoint. 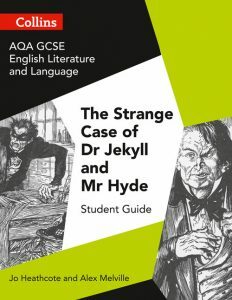 Find out more about the new AQA GCSE English Literature and Language Set Text Student Guide: The Strange Case of Dr. Jekyll and Mr. Hyde, written by Alexandra Melville and Jo Heathcote. What is the chronological order in which events takes place? How does this compare to the order in which we receive information? Why might this be? Why is the ending of the story revealed in letters? With a sound knowledge of the plot, characters and themes before they begin reading, students will be able to focus on the language of the text, and to discuss irony, or the foreshadowing of later events, right from the beginning of their exploration of the novel. They will be able to begin mapping useful quotations onto a chapter plan or reading journal from the first reading, and immediately start to make links between individual passages and the events and concerns of the wider novel: an essential skill for the exam. Alexandra Melville is a writer and educator. Formerly a Head of English, she has taught English at sixth form and secondary schools in London. She has examined for AQA GCSE English and has written education resources for Fuel Theatre, the British Library and HarperCollins. Blog image credit: By Famous Players-Lasky/Artcraft [Public domain or Public domain], via Wikimedia Commons.